I'm based in the UK and in a long-distance relationship with a Thai girl who resides in Bangkok. I've been there a couple of times since we've been together and we decided the next step would be for her to come here for 3-4 weeks on a visitor visa, with a view to getting a fiance visa 6-12 months down the line, so she can come over here and work etc. She recently applied for this and got a rejection based on several criteria, which are shown below. Apologies if certain points of this rejection letter may have been addressed previously but every application is different and I wanted to get some personalised input specifically on my girlfriend's visa rejection letter. 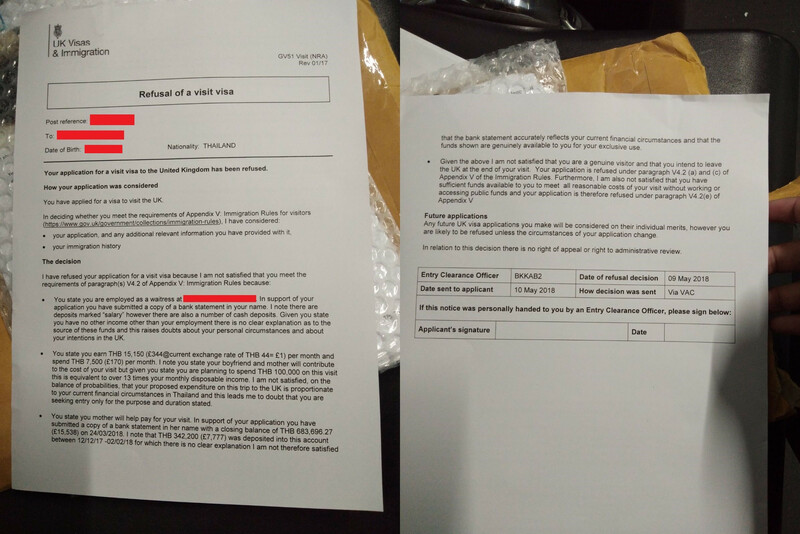 She went through a visa agency which her friend had successfully used previously for a UK visitor visa, and I got red flags halfway through the process when they asked for payment for their services before she even had the VFS appointment. They then advised her to deposit around 80,000 THB into her bank account (which her father had given her in cash at her request) several days before the appointment, as her bank account funds were low (despite the fact I had already agreed and submitted documentation to be her sponsor, and this seemingly being acceptable). She did as suggested and after the appointment at VFS, some further research led us to believe that this could be a cause for rejection (due to being classed as funds parking), as the agency had not advised that we would need to explain where the funds came from (and neither of us have had any previous experience trying to get a visa as complicated as a UK one). She then got the below rejection letter, which indicates this was the first reason for rejection. The second reason was that she stated in her application that she would spend around 100,000 THB on various things on the trip, which is over 13x her monthly disposable income and thus they doubt that she was "seeking entry only for the purpose and duration stated". The third reason given was that her mother would help her pay for the visit, and although her mother's bank statement showed a balance of 683,000 THB, 342,000 TBH of this was cash deposits with no explanation offered and thus they do not believe that "the bank statement accurately reflects your personal circumstances and that the funds shown are genuinely available to you for your exclusive use". 1) The two deposits of 40,000 THB were actually the amounts that her mother would contribute towards her trip, so are we okay to explain this in her introduction letter, if we include a letter from her mother stating this and where it came from? One of the 40,000 THB actually came from her grandmother's account at her parent's request, although this was family savings - we are planning to include a letter for her Grandma to sign which will confirm this. 2) To address the second point regarding the 100,000 THB issue as she had put that this would be the cost of the trip to her.. The English question reads "what is the cost of the trip to you personally?" but she has said that the Thai translation of this question reads along the lines of "how much are you going to use on your trip", which she assumed included the cost of the trip to me as her sponsor also, and therefore gave too large a figure considering the amount she will need to spend will be small. 3) Her mother's bank statements having unexplained deposits. The deposits actually came from work that she does selling farm produce at market, although she has no record of this other than that which is recorded in a book which she uses to keep records (so no receipts etc.). Regarding this point, are we okay to draw from this that the main reason this was given for refusal was due to the funds not being available solely for her and to counter this by stating that the funds are now in her bank account? Any advice you guys can offer regarding how to resolve this without resorting to using an agency (who I'm clearly not convinced by whatsoever) would be much appreciated. Happy to attach copies of the letters from her/her mother/grandmother/me if you think it will help shed some light. Browse other questions tagged visas uk visa-refusals thailand visa-rejections or ask your own question.